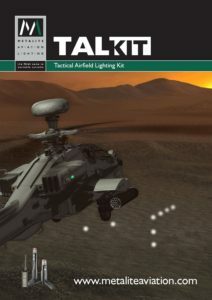 The Tactical Airfield Lighting Kit (TALKIT) is a lightweight, man portable tactical landing light system designed primarily for use by advancing military forces during their initial efforts to establish a minimal temporary landing zone or airstrip. The Tactical Airfield Lighting Kit (TALKIT) is a versatile man portable landing light system that allows fixed and rotary wing aircraft to identify landing areas or drop zones at night at distances of up to 5kms. Able to support non-overt, covert and FLIR operations, the system contains up to 8 landing lights, each weighing less than 1 kg, which can be controlled manually or by radio. Light source is provided by six stacked LED arrays that provide both visual and IR light output in a range of intensities and as a steady, flashing or rotating signal. Visible colours include white, red and green. Power is supplied by rechargeable, high-density lithium-ion battery packs which allow the system to be used over a broad range of temperatures, typically between -40°C and +50°C. The tactical landing light system is recharged via the drop in charger cradle located in the lid of the carrying case, which accepts either AC or DC input. Alternatively DC power can be supplied directly to individual landing lights via a connector at the base of each light unit. As emergency back up the lights can also be powered by a primary cell attached to the base of each light using an external connector. 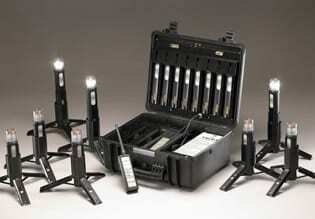 TALKIT is available in a choice of carrying options and the system is suitable for a range of applications. These include portable landing zones or airstrips, at refuelling or rearming areas, during search and rescue missions, as drop zone markers or as route marker or field marker lights.